While most people of the village will be aware that the Northward Hill RSPB nature reserve is an SSSI, or at least would not be surprised to find that it is, few seem to know that there is another area of the village designated as an SSSI or the reason for it being so. To the north-west of the school and church and to the north of the houses that line Cooling Road, there is an area of scrub covering land that has fallen away in an uneven manner. A public footpath runs through the area from Forge Lane into the RSPB reserve. This area of scrubland forms the Dalham Farm SSSI of 8.2 hectares (21.7 acres). Most of the area is owned by Wyborne/Dalham Farm but approximately 3 acres to the south-east of the footpath is owned by Jeanette and me. Dalham Farm is thought to illustrate possibly the lowest angled slope failure in Great Britain, ie land that has slipped despite its slope being very shallow. For this reason it was designated an SSSI in 1987 although the slippage had been obvious for at least 20 years before that. Fortunately, the ridge of land on which the houses, church and school sit has been unaffected although parts of some of the gardens have dropped away. Map of the area occupied by the Dalham Farm SSSI. There has been much speculation as to how the slippage was precipitated. The most popular theory is that it was a result of dredging being carried out in the Thames, because of the coincidence in timing, but there seems to be no certainty about this. Until the early 1990s, the area was kept much more open by the grazing of horses and this meant that the effect of the slippage was visible in some places as a series of regular ridges that gave a clearly terraced appearance. Little of this is now apparent because about 90% of the area is covered in small trees, bushes and bramble; to a very limited extent the slippage can be appreciated by the severe unevenness of the footpath that passes through the SSSI. This overgrowth means that the folds in the slipping earth are hidden. 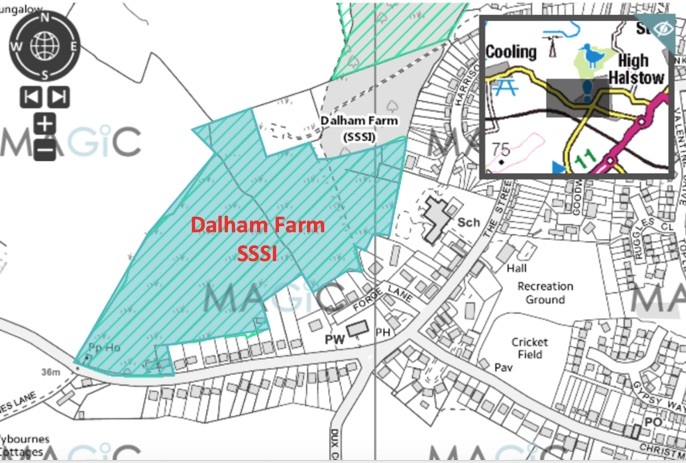 Because of this, at its last inspection by Natural England, who are charged with protecting SSSIs, the condition of the Dalham Farm SSSI was considered to be “unfavourable”. 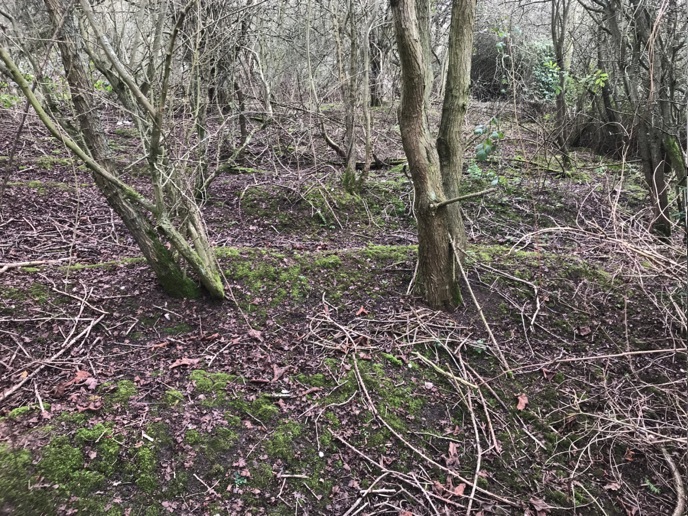 One of the few areas where the nature of the slippage is visible is on that which we have kept clear by sheep/goat grazing; this can be seen from the boundary with the school. Over the coming year or two we aim to clear more of the land closer to our boundary with the footpath. We will avoid doing so in the Spring and early Summer when bird nesting occurs and will limit the clearage of the larger bushes and trees to minimise the impact on birdlife more generally. Hopefully this will mean that this strange feature of our village can become more obvious again on at least one small part of the SSSI. This entry was posted in Blog and tagged Dalham Farm, SSSI. Bookmark the permalink.